Two unrelated pairs of genes located on separate chromosomes control the 3 colors. Both “E+” red and “e” red are recessive to black so every red Dexter carries 2 red genes. 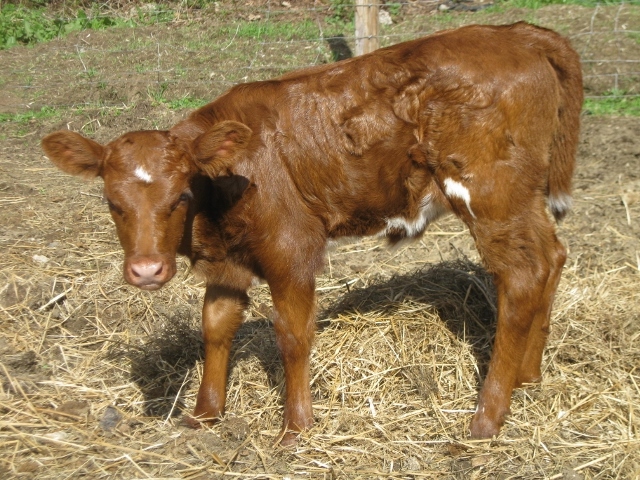 A pair of red Dexter parents will only produce a red offspring even if both parents carry a hidden dun gene. 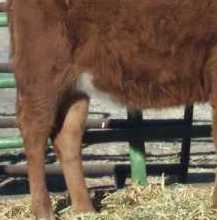 A brown mutation is responsible for the dun color. Dun is recessive to black, so every dun colored Dexter carries 2 dun genes. A Red if both carry a Red gene. Red is the only Dexter color that will breed true. Black is dominate, Red is recessive. 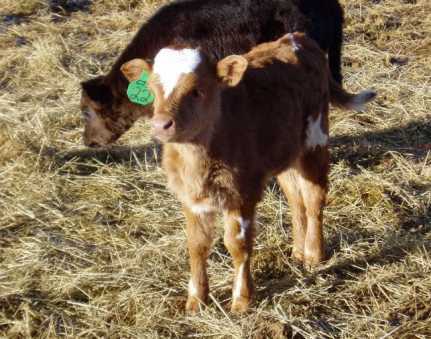 You can "test" a Black to see if there's a recessive Red (&/or Dun) gene through a Lab sample test or by breeding (you get a colored calf from a breeding). If you cross 2 recessive carriers you can get the Red or Dun from black parents. (It takes 2 recessives to produce the colored offspring). Dun's can be produced from Blacks (with the Dun recessive) and also from Reds (with a Dun recessive). Duns themselves will produce Dun, Red or Black with compatible color matings. 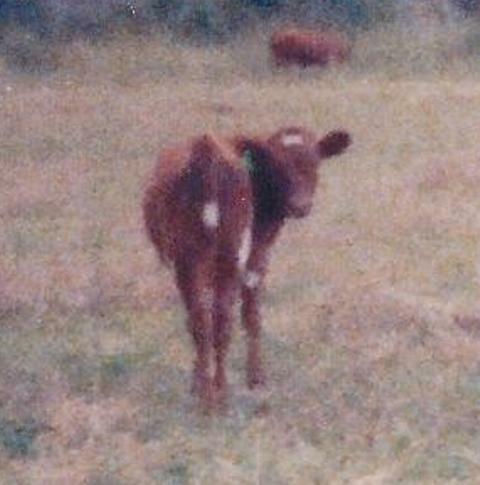 Red bred to red will only produce Red no matter what other colors are in the background. (If a Black animal didn't carry a recessive color gene it could only produce black offspring. Two Red parents can only produce Red offspring. cream colored. Sheila's findings indicated that can't be the case. Reds will only produce Reds when bred together. 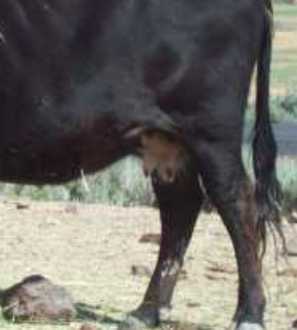 Since the wild type for white spotting is a lack of spotting, any white spotting on cattle is due to a mutant or combination of several mutants. In general, the understanding of the genetic control of white spotting is complete except for a few patterns discussed later. 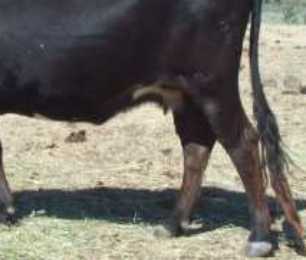 A major mutant gene affecting spotting patterns in cattle is the Piebald; irregular areas of pigmented and white; feet, belly, and tail usually white recessive Holstein, Guernsey, Jersey, Simmental, Ayrshire, Maine-Anjou and others exhibit this gene. In some solid-colored breeds, white spotting along the underline, especially in front of the navel may be due to the presence of this Piebald gene. In many cases, however, such spotting is not caused by the Piebald gene and it is unclear as to the genetic mechanism involved. 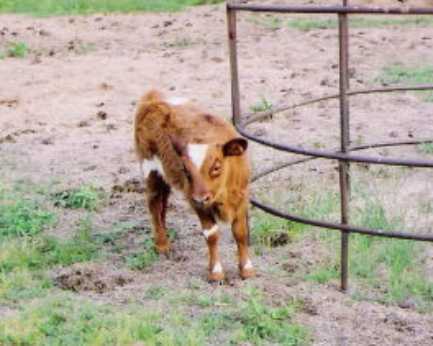 Selection against such animals should reduce the incidence of such spotting, but reduces the selection intensity possible for traits related to productivity. Black or Dun or Red or ? 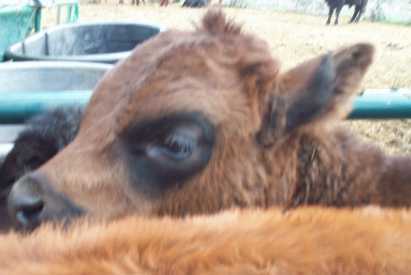 This calf with a black muzzle and black eye circle will shed out as a Black Dexter. The color transformation will usually complete by 6-9 months of age.